Electric Gypsy, a designer of vintage reproduction dresses is extending a limited wholesale release of handmade vintage reproduction dresses to boutiques and vintage clothing shops worldwide, the online vintage store announced today. Our vintage inspired reproduction dresses fit a wider range of women better than original items. They are more comfortable and more forgiving to today’s female proportions. The number of dresses available wholesale to boutiques will be in strictly limited quantities and on a first come, first served basis: “I don’t ever want to sacrifice quality simply to meet demand – I’ll run a waiting list before I compromise on quality.” Electric Gypsy’s wholesale minimum order is £150, with a minimum requirement of 2 dresses in the same style and fabric – in any size. The company also accepts international orders and ships worldwide. The Electric Gypsy is an online vintage store selling handmade vintage reproduction dresses adapted from original patterns and designs – all handmade in Devon, England. Dress prices start from £30 with free UK delivery. Emma Marsh of Electric Gypsy welcomes interviews and questions from both press and vintage bloggers worldwide. 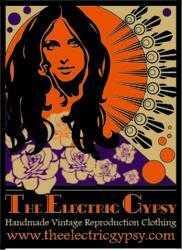 For interview requests, please email info(at)theelectricgypsy(dot)com or call +44 (0)1392 270 142.